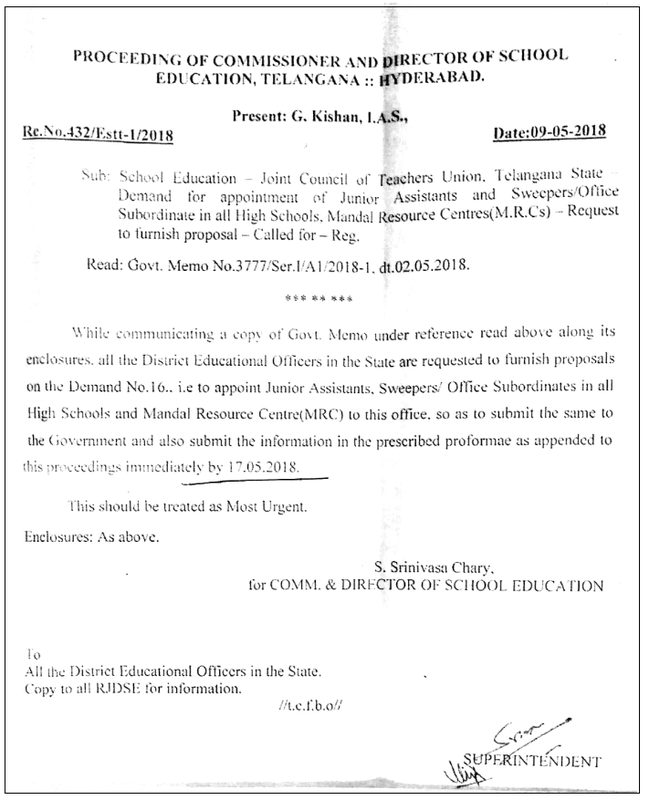 Recruitment of Junior Assistants, Office Subordinates/Sweepers Appointment Proposals in MRCs, High Schools of Telangana.PROCEEDING OF COMMISSIONER AND DIRECTOR OF SCHOOL EDUCATION, TELANGANA Hyderabad Rc.No. 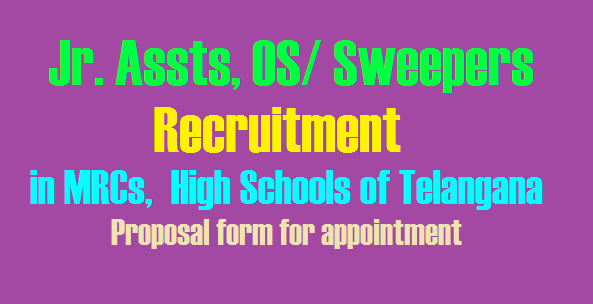 432/Estt-I/2018 dt:09-05-2018 Junior Assistants, Office Subordinates/Sweepers Appointment Proposal form to recruit in MRCs, High Schools of TelanganaProposals to Appoint Junior Assistants Office Subordinates Sweepers in all High Schools of Telamngana: School Education Department Telangana State instructed DEOs of all Districts in Telangana send proposals to appoint Junior Assistant Office Subordinates sweepers in all High Schools and MRCs in Telangana. These Posts may fill up on contract basis immediately for the Academic year 2018-19 Proposal form to recruit Junior Assistants, Office Subordinates/ Sweepers in MRCs, High Schools of Telangana available here. 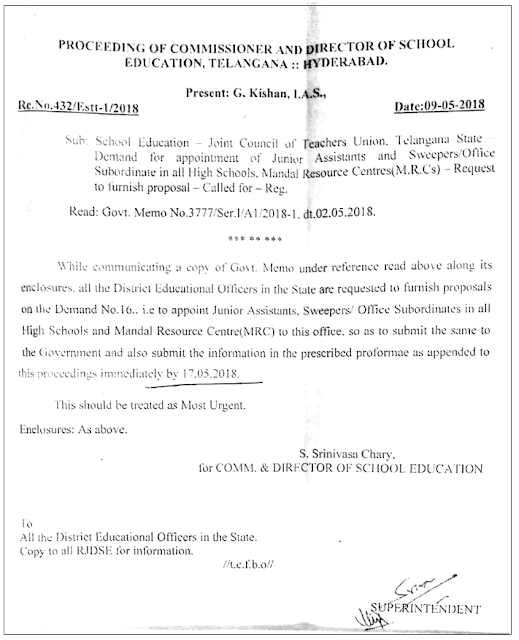 Commissioner and Directorate of School Education C & DSE Telangana State issued instructions to District Educational Officers of all Dists in Telangana to furnish the existing Sanctioned Vacancy and Working status of Junior Assistants Senior Assistants Office Subordinates Sweepers in all High Schools and Mandal Resource Centres in Telangana. Sub: School Education - Joint Council of Teachers Union. Telangana State Demand for appointment of Junior Assistants and Sweepers/Office Subordinate in all High Schools. Mandal Resource Centres(M.R.Cs) - Request to furnish proposal - Called for - Reg. Read: Govt. Memo No.3777/Ser.1/A1/2018-1, &02.05.2018. While communicating a copy of Goat. Memo under reference read above along its enclosures. all the District Educational Officers in the State are requested to furnish proposals on the Demand No.16.. i.e to appoint Junior Assistants. Sweepers/office Subordinates in all High Schools and Mandal Resource Centre(MRC) to this office. so as to submit the same to the Government and also submit the information in the prescribed prolormae as appended to this pr; ceedi k:s immediately by 17.05.2018.